This should probably be the title for a post filled with beautiful fall pictures. It’s not but it was a good day anyway! Started out at Weight Watchers. I only lost a quarter of a pound, but that was ok. I lost and I’m getting back on track again, which may not seem likely by something I’ll be showing later, but what the heck! First I want to show you a protein packed dinner I made for myself last night that took 5 minutes to put together but was delicious. 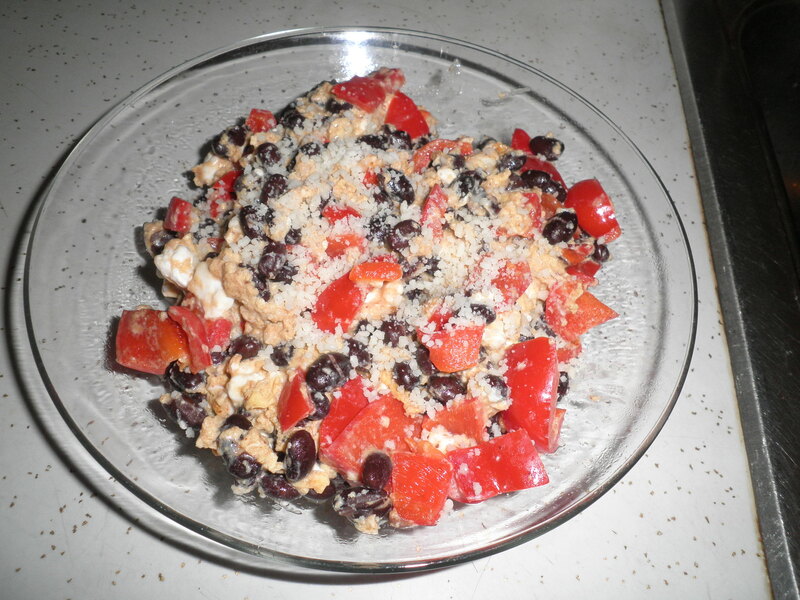 I sautéed a red bell pepper, then when it was partially cooked, I added a cup of black beans, the last of what I made last week. I mixed together 2 eggs with a little milk to thin it out and a half cup of low-fat cottage cheese. Mixed it well and poured it over the pepper/bean mixture. Stirred it around a bit for the eggs to cook then topped it with some Locatelli cheese. This was so good and had 3 sources of protein. Very filling too. I should try for things like that more often. Saturday morning after WW, got back into our routine and Gail, Alice and I went to breakfast. I was feeling oatmeal and this was so good! Ralph and I went on a mission to sell an antique platter to a shop in Mullica Hill. Turned out that she didn’t want it because she only takes perfect pieces, this had a small repair. It was packed away so long, I didn’t remember about the repair. We took it to our friend’s shop and they took it on consignment, so we’ll see what happens. 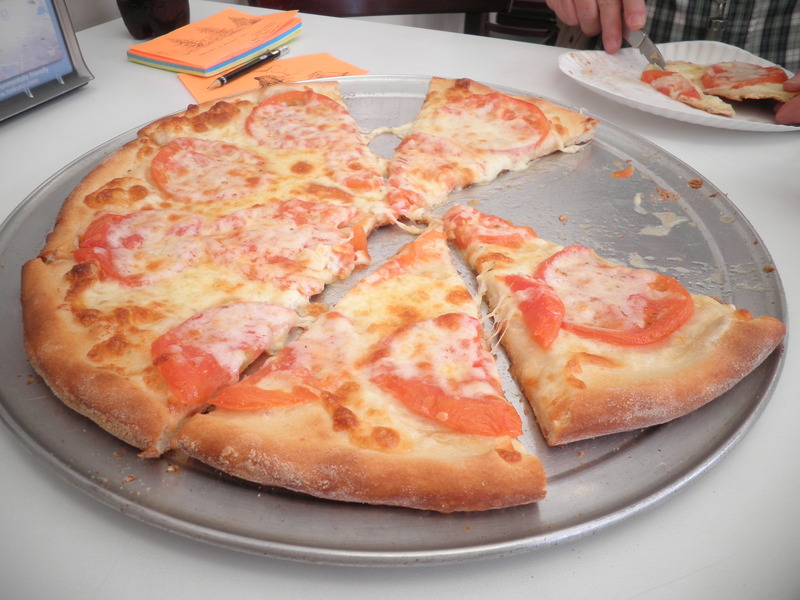 Eat Pizza! This was really good counted for lunch and dinner, so I don’t feel too bad about it. Now if it hadn’t tasted good…I’d be really disappointed! So I didn’t get any work done on any sorting and didn’t find anything old and interesting. But after a nap-still catching up on sleep from the other night-I made a crock pot full of apples! Well…the apples were old…does that count?! Besides, they work great for snacks and they’ll help me stay on track in the week to come. 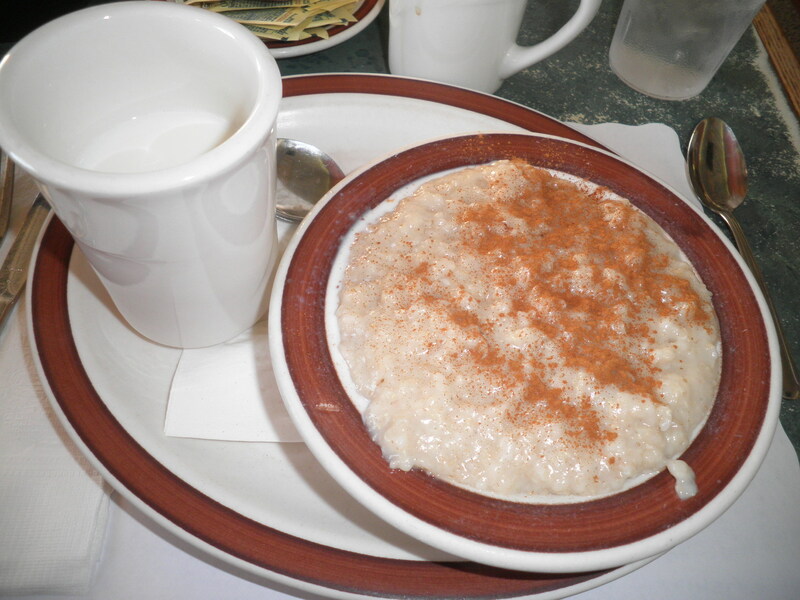 This entry was posted in Uncategorized and tagged oatmeal, sorting and packing, Weight Watchers. Bookmark the permalink. hey, we still have 2+ months of 2102, so lots o’ time to get on this year’s goals! glad you are on a positive roll, fran! 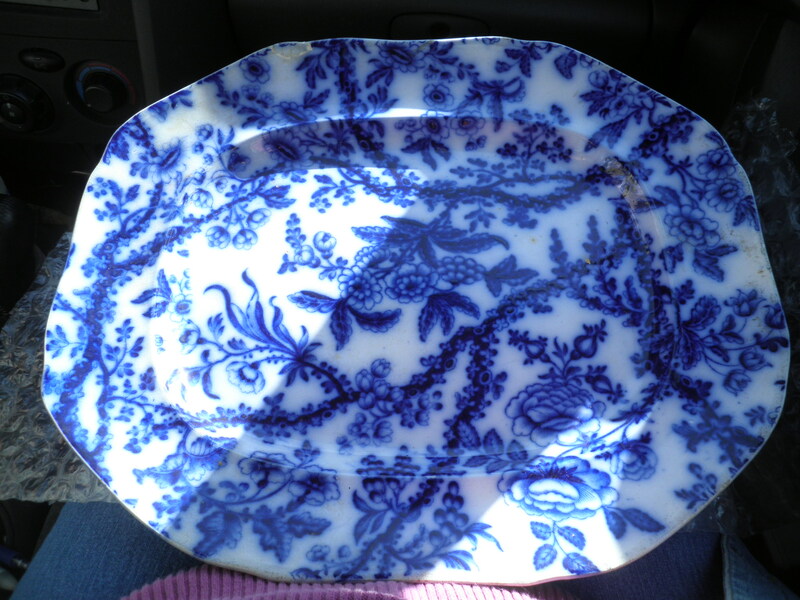 the platter is beautiful, sorry it wasn’t accepted…good luck with the consignment! i have a dinosaur of a home computer that i want to box up and donate…that is the task i need to get on. this aft?!! Why not, today, Cathy?! I think I need to think in that mind set. Do it today and you can do something else tomorrow. It is cutting down on my reading time, but I can work around that! Happy Sunday! sorry about the plate….I’d let you sell me but ,sadly, I am chiped and in need of repair also! Always a good idea, Dana! Enjoy your day!! I think that dish is really pretty..
Oatmeal is definitely just the thing on a cool fall day (and so are those apples). Thanks, Zo. I love making the apples that way and my friend just gave me a huge bag of apples-the last from her brother’s tree. I’m going to crock all of them up tomorrow and then see how well it works freezing them. I think it should be good! Have a great Sunday! Someone has to want that gorgeous platter! Happy Sunday! Thanks, Stacie, I hope so!! I definitely agree with the better late than never thing, and as the top commenter said, there’s still over two months left of the year! 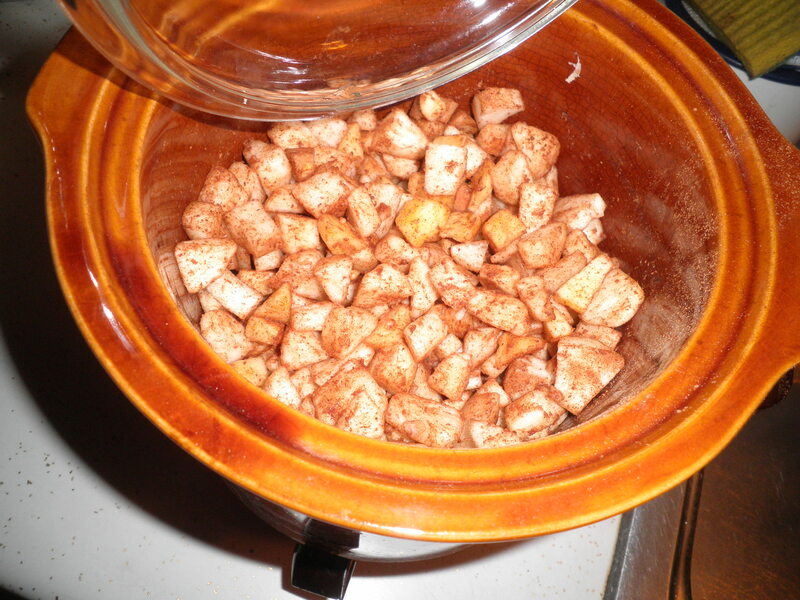 Elle, doing the apples in the crock pot is wonderful and they make the house smell wonerful!! Thanks for the encouragement!